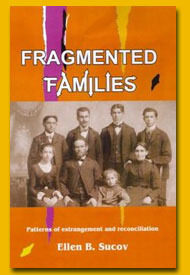 The families who are described in Fragmented Families are alive and real. The relationships and family process are depicted accurately, as family members described them to me. To ensure confidentiality, all of the stories have been modified and the names, places, and other details have been altered. If you recognize certain family patterns, you are probably correct, since many of the elements are universal and familiar. If you think you can identify an individual person or a specific family, you are probably wrong. It's all made up, except for the parts that are true. When the marital bond is severed, a seismic shift is set off in the family. Attachments that were taken for granted are now seen to be fragile and unreliable. New animosities erupt, exacerbating the instability in an already volatile emotional climate. If children are involved, the tensions will be heightened by custody battles and disputes over visiting rights. There may be lengthy separations from one parent, estrangement from grandparents on one or both sides of the family, and rifts between relatives in the extended family, who invariably take sides in the conflict. Mel's story illustrates the process of estrangement and its resolution in a divorced family. Spring, 1952. Mel was an officer in the US Air Force, stationed in Germany. One weekend, he was on leave in Paris. He recalls the scene where he was sitting alone in an elegant café. An elderly couple entered and settled down at an adjoining table. They ordered coffee, opened a brown bag and took out their lunch. The waiter approached them, indignant, threatening to evict them. Suddenly, a stunning young woman entered. She sauntered past Mel and seated herself at a nearby table. Mel's attention was riveted on her. They exchanged smiles, began to chat, amused at the waiter's determined efforts. She moved to Mel's table. They ordered wine, talked for a long time, and left together. This was the beginning of their ill-fated romance. Marla was an exotic mixture of Indonesian and English, in Paris for a holiday. Her Austrian parents had fled Vienna after the First World War and settled in Jakarta, where she and her brother were born. Her father, a successful businessman, was the patriarch of a large Jewish family. Marla was born in 1928, two years after her brother. The family flourished in Jakarta and remained there throughout the war in Europe, thus escaping the trauma of the Holocaust. After the war, Marla's father decided to move to England, where he could reestablish his business ventures. Marla was then almost twenty, a spoiled young woman, accustomed to luxury. When she met Mel, she was twenty-four, seductively pretty, eager to find romance. After their chance meeting in the café, Mel returned to his base in Germany, but they met at every opportunity and their romance bloomed. A year later, they became engaged. At that time, Marla's family had been settled in England for about five years. Her father had developed successful business enterprises with large corporations in the Far East and his fortune had continued to expand. Suddenly, with a new regime in Indonesia, his contacts evaporated, his shipments of expensive equipment were confiscated, and within a few months, he had lost virtually all of his assets. The family went into shock, unaccustomed to any deprivation or setback. Marla was completely devastated and turned to Mel as her "savior." Perhaps he would be the one to rescue her and the family from this crisis. Mel did seem to fit the role, especially when he offered to loan her father enough money to bail him out of his overwhelming debts. After their wedding, Mel and Marla set up housekeeping in a small flat near the Air Force base but she was miserable and lonely. She spent each day weeping and complaining, unable to cope with the responsibilities of marriage and longing for her parents. Almost overnight, the beautiful, seductive woman Mel thought he had married turned into a pouting child. After a few months of arguments and disappointments, Marla returned to her parents' home in Manchester. Mel made sporadic attempts to visit her, but eventually he realized that there was little basis for a viable marriage. When Mel's tour of duty ended, he informed Marla that he was returning to the States. She must have had second thoughts because by that time, she was desperate to reconcile and try to mend the rift. When she promised to join Mel in Arizona, he bought a home, furnished and decorated it, installed a swimming pool and prepared for her arrival. But within a few weeks, the barrage of complaints began: she found fault with the neighborhood, the house, everything. Interspersed with their awkward attempts to rekindle a spark of romance, new arguments erupted. During this period, Marla became pregnant. Their son was born when Marla and Mel were both thirty-one. They agreed to name him Ned, to honor the memory of Mel's grandfather and Marla's Uncle Nathan. Initially happy about the birth, they determined to remain together. But soon the bickering resumed. Hoping to avoid separation for the sake of the child, the couple sought help from a rabbi and a marriage counselor. After several sessions, it became clear to everyone that the marriage would not survive. Mel filed for divorce and reluctantly agreed to Marla's demand that she would remain in the house "for Ned's sake." Mel moved to a nearby apartment and continued to support mother and baby. However, his efforts to visit his son were repeatedly sabotaged by Marla. The tension between them came to a head during a series of acrimonious court hearings, culminating in the judge's decision to grant custody to the mother. Mel, feeling defeated and frustrated, was given the right to visit his son one day each week. The judge wrote a restraining order that prohibited Marla from leaving the country. A few months later, shortly before Ned's fourth birthday, Marla took him to Canada and from there to England, effectively "kidnapping" her own child. Mel initiated a series of legal maneuvers to have his son extradited to the States, but all his efforts failed. During the next few years, there were sporadic attempts on Mel's part to communicate with his son and obtain legal rights to visit him. Again and again, Marla managed to sabotage those efforts. Finally, Mel flew to England, hired a lawyer and went to court to obtain custody of Ned. The case became a "cause celebre" in Manchester. Photos and stories of the family were on the front pages of newspapers during the entire week of the hearings. People were calling for a "Solomonic decision" on the part of the judge, who had to determine which parent was best qualified to be given custody of Ned. After hearing the tearful pleadings and impassioned arguments from both sides, the judge decided in favor of Mel and ordered Marla to give the boy to his father. Instead, she "kidnapped" Ned once again and fled the country. Much later, Mel learned that she had gone to her brother's home in Israel, where she remained for several months. Throughout this long sequence of battles, Mel was not the only one to be deprived of his natural role. His aging parents never knew their only grandson. For several years, Mel persisted in trying to make contact with Ned. He wrote letters, sent gifts, tried to phone, but Marla foiled every one of his efforts. During this time, Ned struggled through high school and took a job as a delivery boy on the streets of Manchester. Shortly after Ned's eighteenth birthday, the boy phoned Mel and asked if he could visit him in Arizona. He wanted to check out the monster his mother had described to him. Mel was elated at the prospect of seeing his son and not surprised at the negative image Marla had painted. Perhaps the visit would dispel some of Ned's suspicions. But to Mel's great disappointment, their time together was a disaster. They "just didn't click." Ned was wary and reticent. Father and son could not seem to find any common ground. There was only one topic that interested Ned: the divorce and its aftermath. He asked countless questions about why, when, and how his parents had quarreled, and why Mel had never tried to contact him during all those years. Mel explained that he had written, he had sent gifts, and most important, he had contributed to Ned's support. These revelations baffled Ned, since they contradicted everything his mother had told him. Put off balance, he became more morose and confused. Now he felt compelled to "choose" between one parent and the other, unsure of whom to believe or trust. It became clear to Mel that a true reconciliation could not occur at this time. After waiting so many years, it seemed that he would never have a genuine role in his son's life. During the next few years, significant changes occurred in the family's situation. Ned entered college in England, excelled in his business courses, and went to work as a trainee in a bank. In the meantime, Mel's mother died without ever having known her grandson. After her death, Mel was more determined than ever to contact his son. He flew to Europe, stayed with a friend in France and phoned Ned, inviting him to come for a visit. At first Ned refused but Mel persisted, calling each day to suggest an alternate venue. Finally, Ned agreed to meet his father in Paris for a weekend. When Mel saw Ned, he realized that the young man had matured and become more approachable. Mel learned that Marla's parents had died, leaving her without money or security. Ned was contributing part of his trainee's salary to help support his mother. Appreciating his son's predicament, Mel offered to buy him a car and gave him money for Marla. As Ned came to realize that he could depend on his father, they began to connect. Looking at Ned's face, Mel was struck by the resemblance to his own. They were astonished to find that they actually liked one another. This new rapport between father and son was the turning point in their long estrangement. Ned and Mel parted with the feeling that a genuine kinship had finally begun to develop. As these changes were unfolding, other events were impacting on the family. Mel, an ardent Zionist, decided to move to Israel. Ned informed his mother that his company was transferring him to a subsidiary office in New York. When Marla found herself alone, her defiance and resistance collapsed. Perhaps she realized that she no longer had the power to control her son's life. Now, several years have passed since the first frustrating meetings between father and son. A warm, mutually satisfying relationship has evolved. They speak to each other frequently and come together for a week-long holiday each year. Mel lives in Israel; Ned is married and settled in Boston. They never discuss "old times." Mel does not complain about Marla and Ned does not discuss the divorce or its aftermath. Apparently the two men do not need to dwell on the past. After many years alone, Mel recently married. The two women, his wife and his son's wife, have formed a warm friendship, rejoicing at the miracle of the reconciliation between Mel and Ned. The moment at Ned's wedding when Mel faced Marla, without rancor or defiance, represented the final scene in their long and bitter conflict. The impact of a contentious divorce often ignites many "brushfires" in the extended family. It creates hostilities that spread to other relationships and spawn additional cutoffs. In Mel's family, the divorce resulted in estrangement, not only from his son, but between Ned and the older generation, depriving Mel's parents of the role of grandparent. Because of the bitter antagonism between Mel and Marla, Ned grew up without a father. They connected only after he reached adulthood. In many divorced families, there are complex patterns of separation and re-alignment, interspersed with repeated accusations and retaliations. Mel's story was played out over a period of more than thirty years. It took a long time for the bonding between father and son to develop. We cannot know if Marla has resolved her anger and moved on to build a new life. We do know that in many families in which a divorce has occurred, no complete healing or repair is possible. For Mel and Ned, there is the gratification of knowing that a prolonged separation has been transformed into a meaningful, harmonious relationship.